The least I could do for my five kind friends who gave up their sunny San Francisco Sunday afternoons to come and help me candies and sweets for the charity bake sales I have been organising at work to raise money for the AEF/BCEF, was to provide them with a tasty brunch. All of us are big lamb lovers, and as I had a de-boned leg in the freezer and my new Jamie's Dinners cook book to try out, I decided to make them the Naked Chef's Moroccan lamb recipe. This is a really simple and tasty meal to make with loads of flavour. The lamb is marinated in a mixture of yoghurt (I used Greek Total ) with garlic, chickpeas, mint and cilantro and then roasted, on the oven shelf over a pan of cumin-dredged veggies. I used squash, turnips and onions (forgetting to purchase the carrots also included in Jamie's recipe, oops). Thanks to a tip on Jamie's forums , I learnt that cooking the lunch this way might lead to a hot and smoky kitchen, hardly optimum conditions for a candy-making exercise. Luckily our landlord was kind enough to leave us a huge gas grill on our deck. It even has a spit. Today was the day to learn how to use it. 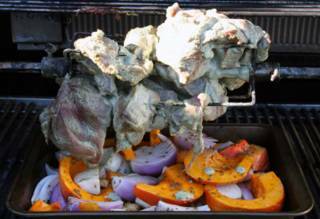 I left the lamb turning on the grill, with the vegetables in a roasting tray underneath, the lid closed. After an hour, brunch was ready, without filling the house with fumes. I served it up, outside in the sun, with grilled pitta and the remainder of the marinade (as Jamie suggests), which makes a tasty sauce. I could hardly expect my guests to spend all afternoon creating sugary goodies without something to satisfy their own sweet teeth. 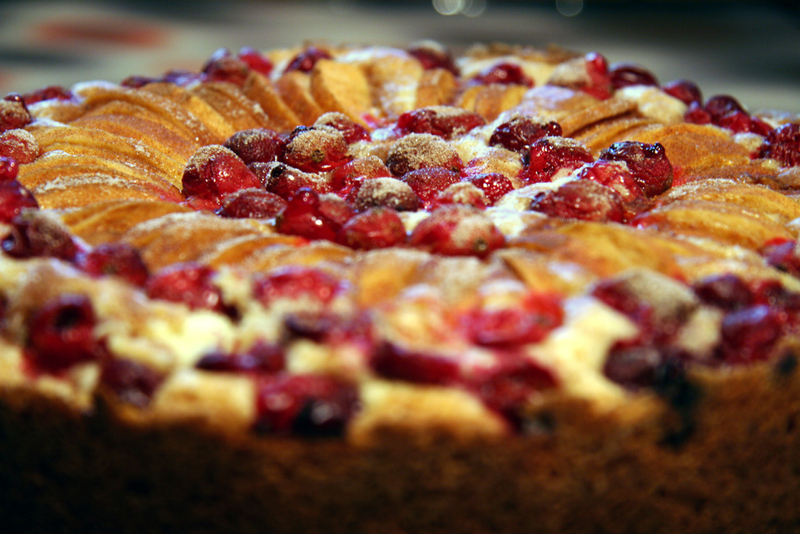 I fell back on a reliable recipe from The French Laundry cookbook which never lets me down, "Sally Schmitt's Cranberry & Apple Kuchen". It's easy to make and tastes delicious, especially warm from the oven. The sharp cranberries and apples make a piquant contrast to the mildly nutmeg and cinnamon-spiced white cake. Man, that kuchen is GORGEOUS! Do you ever post recipes? I'd love to try it. I can only post recipes if I invent them myself because otherwise they are copyrighted to the original publisher - in this case Thomas Keller. A quick internet search showed up lots of "Apple Kuchen" recipes which are similar. Maybe you could try one of those, arranging the apples and cranberries on top as in my photo, or you could get someome to buy you the book for Christmas...? and the kuchen... so beautiful!